Anyway one of the things I dearly wanted to see was the Newseum. I went there once several years ago, but only made it through the door late in the day, so the whole experience was something of a mad cap rush to see as much as possible before security guards kicked me out. Not so this time, this time I had planned. This time I spent 5 whole hours in the place. And it’s great. If you work in news, want to work in news or simply have any amount of interest in news, the Newseum is the place for you. It caters for all ages – there’s a TV studio where kids can pretend to be on the spot reporters, a huge collection of front pages from around the world, a massive long screen showing news highlights and a moving 9/11 section complete with accompanying tissue box for those it’s just too much for. I can’t fault it as a museum of news gathering. It talks about how the FBI worked with reporters, has hallway exhibitions on newspaper comics, has the required picture of Truman holding up that frontpage with the Dewey defeats Truman headline. It’s great at showing how 20th century history was defined by news gathering and how important journalism was as a discipline. But you know what it’s not great at – anything that happened since 2007, when it opened. And as it’s a museum of news and that’s 7 years ago, that’s a hell of a lot of time not to be covering. Oh there’s references – the obligatory “We got Bin Laden” front page, a mention of Snowden and royal births in the TV round up, a truly dreadful social media experience with interactive games. But really, it’s quite poor post launch. News of the World/Phone hacking – a huge scandal which has led to journalists moving from high of the most trusted list to second only to dodgy types trying to convince you they have £1bn to move out of Africa and only need your account details to do it. Rise of social media reporting – a brief mention of the Arab Spring, but nothing about how social media was the catalyst. Commercial vs editorial – the only mention I could find about this was in the Murrow exhibit where they mentioned sponsors wanted him to focus on the popular in order to maintain their viewing figures. Nothing about the impact of commercial ownership on news channels or the pressures from advertisers. Nothing about gated content or the struggle to make money online. Nothing. Blogging – a mention of the Drudge report and a few US blogs that managed to get white house credentials. Nothing on HuffPo or the rise of the citizen journalist outside of some mentions in the freedom on speech section. Very little on radio really – only one gallery showing the growth of radio alongside TV with the normal mention of FDR’s fireside chats. What about modern talk radio? Podcasts like this American Life? History was very US focused, and I get that, it’s a US Museum, but there were a lot of moments just skipped over and that got a little galling. Nothing about new developments like crowd sourcing news (and the dangers thereof) or the rise of listicles. Facebook was mentioned in the same panel as a discussion about an app that reads the news to you (so 2007). It just felt like they haven’t tried to look at journalism now at all, only at journalism in the key moments. The glory days. What about all those times things were wrong? And surely any museum dedicated to any subject needs to grow alongside that subject? Otherwise it becomes outdated. And while I loved the Newseum and would highly recommend it to everyone ever, the fact that it dismissed the rise of digital journalism with interactive games and some wall panels that look like they came out of a primary school makes me wonder if it’s making the same mistake as so many elements of the profession are. If those who don’t learn from the past are doomed to repeat it, surely those who don’t try and adapt to the future really aren’t going to be around to write about it? Print readerships are literally dying off, and newsrooms all over the place are continually cutting staff numbers. 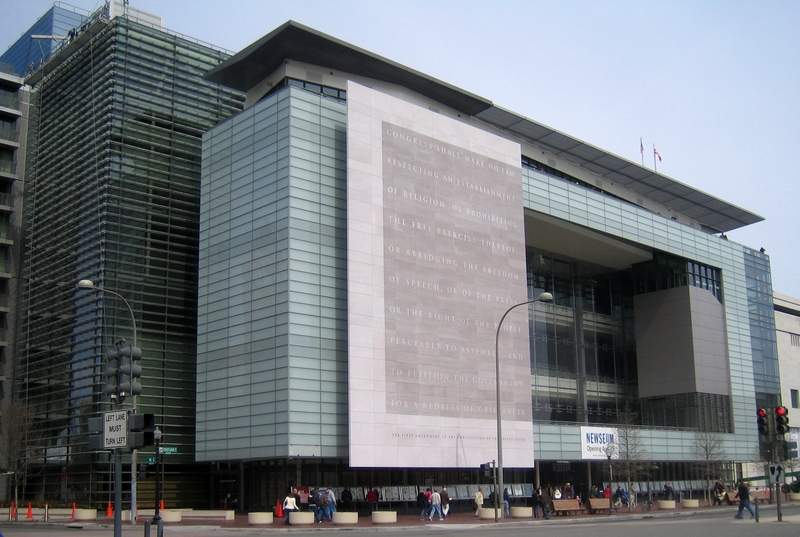 It seems to be that the Newseum is in the same position now that most mainstream news outlets were in a decade ago – either embrace digital and learn to work with and make money out of it, or watch your audience dwindle to nothing and fade away. And it’s such a great museum. I really don’t want to see it fade away. But I really don’t see how it can inspire the next generation of great news writers if all it wants to talk about is the glory days of TV anchors and war reporters. News moves on. The Newseum should too. This entry was posted in Digital publishing and tagged future of news, history of news, Newseum, Washington DC. Bookmark the permalink.